AD Classics: Ronchamp / Le Corbusier -> Архитектурная мастерская Арх-хаус: Архитектурное проектирование, Дизайн проектирование, 3Dвизуализация, 3Dмоделирование. One of the most interesting aspects of the design is the sporadic window placement on the walls. Corbusier implemented small puncturing apertures on the façade that amplified the light within the chapel by tapering the window well in the wall cavity. Each wall becomes illuminated by these differing window frames, which in conjunction with the stark white washed walls gives the walls luminous qualities punctuated by a more intense direct light. On the wall behind the altar in the chapel, the lighting effects create a speckled pattern, almost like a starry night, of sparse openings that are complimented by a larger opening above the cross that emits a flood of light, creating a powerful religious image as well as a transformative experience. From the field below Ronchamp, the curving walls and roof are what define the chapel formally. It appears as if it is growing directly from the hill itself as the curve of the roof seems to be a mirror of the curve that the chapel sits on. However once inside, the curving walls and roof no longer define the pure essence of the project, rather the light is what defines and gives meaning to the chapel experientially. Even though, Ronchamp was a radical derivation from Le Corbusier’s other works, it still maintains some of the same principles of purity, openness, and communal sense of coming together. 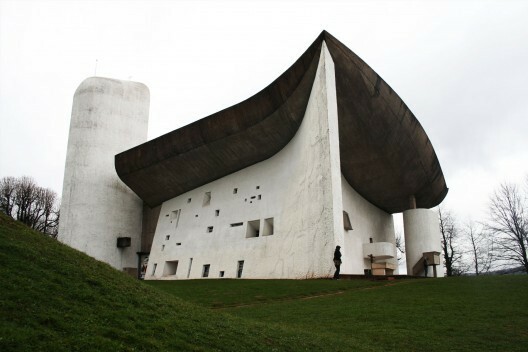 Ronchamp was less of a move away from the mechanistic, International Style, as it was more of a contextual response to a religious site. Ronchamp is an architecture rooted in context that’s based on modern principles, which makes Ronchamp one of the most interesting buildings of the 20th Century and of Le Corbusier’s career.